Even in today’s casual working environments and relaxed lifestyles, a man needs dress shoes. Nothing ruins a formal look like an incorrectly styled shoe, and nothing ruins a good time like shoes that don’t feel good and fit well. When life presents an opportunity to show off your more formal side, it’s important to be prepared. In this guide, we’ll cover not only the best and most fashionable men’s dress shoes this year, but give you all the information you need to wear them well. These incredibly popular men’s shoes come in a wide variety of colors and detail options to suit nearly every man’s suit. The Bruno Marc men’s dress oxfords are available in all the basic colors, with shapes, stitching, and brogueing to stand out as much as you like in formal shoes. For the most formal attire, choose the black patent leather shoe to wear with a suit. For summer wear or more casual occasions, the light brown brogues will look stylish without being stuffy. These men’s dress shoes have great style and versatility at an affordable price. The synthetic uppers come with a variety of finishes, toecaps, and brogueing details to add style, while the interior is lined with premium leather and has latex cushioning. With a 1-inch heel height, classic rounded wax laces, and classic round toe shape, these Oxfords are suitable for nearly any formal occasion and are surprisingly durable. These are truly handsome shoes for the accessibility of the purchase price. The shoe fits true to size, which is always something of a risk when ordering shoes online. The synthetic material offers natural protection from the rain and harsh weather, and they are easier to care for and clean than leather. While each design has a slightly different treatment for the tread on the sole, they do all have some form of tread for additional traction, and the range of good-looking options is excellent. The Bruno Mark men’s dress oxfords are not very durable, and won’t hold up for extended, rough wear. They aren’t designed to be worn every day by men who work on their feet. They are designed for men who only need dress shoes from time to time, and are not an everyday shoe. The men’s Oxford from GM GOLAIMAN offers timeless styling at a reasonable price. With the traditional rounded toe and toecap, the classic five eyelet vamp, and wingtip options with brogueing, any man can have the quintessential formal dress shoe at a reasonable price. These oxfords are made WITH premium-quality synthetic leather upper, with different finishes and shine to emulate different qualities of leather in the shoe. The color range and styling options are heavily traditional, offering classic formal styling that will suit nearly any occasion. The interior of the shoe is lined with breathable leather and has a latex-cushioned footbed for extra comfort. The soles are durable and offer excellent traction, and the 1.18 inch heel height is ideal for formal dress. 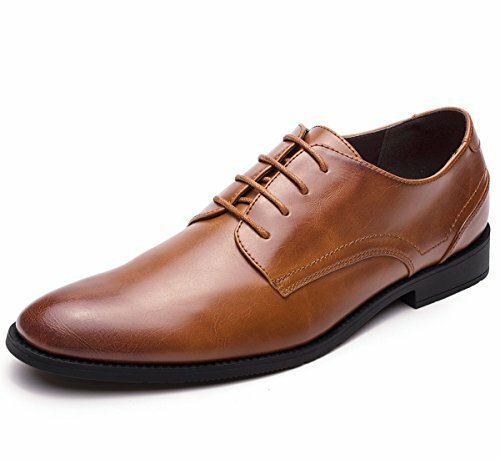 These oxfords are an excellent choice for simple, classic elegance without worrying about passing fads or spending too much money. The excellent detailing and traditional styling works for a wide range of workplaces and formal occasions. These shoes run true to size, have great traction, and are comfortable to wear. At this price point, durability is perhaps too much to expect, and these aren’t very durable shoes. The synthetic surface starts to show wear and creases early. While they are comfortable enough to wear every day, they will not maintain a nice finish and formal look after prolonged heavy wear. If you want classic style, it’s good to look to a classic brand. Clark’s shoes are known for being comfortable and durable, with traditional styling and classic colors. These tilden cap men’s oxford shoes live up to that expectation, delivering a shoe that will fit perfectly in any formal or dress occasion, but without offering any fashion-forward embellishments. The tilden cap oxford shoe from Clarks offers excellent quality and attention to detail in construction. The upper is made from imported leather in the classic blacks and browns of men’s formal wear, with quality stitching and classic construction. The rubber sole has excellent traction, and the fabric-lined interior has a built-in Ortholite insole for extra support, cushioning, and comfort. The interior also helps to prevent excess moisture and odor, which is a welcome feature in a shoe meant to be worn throughout the workday. The squared-off toe of these oxfords sets them apart from the rest of the pack. While rounded toes are the most classic and formal of the oxford styles, squared off toes are considered handsome and stylish, and work with a variety of fashion choices. They are a good choice in this shoe, as they create more room in the toe box without visibly affecting the fashion and design. These shoes have classic style, excellent construction, quality materials, and are both comfortable and durable. There’s a lot to like in the Clarks tilden cap oxford, particularly if you are wearing them in a workplace, where they can be worn comfortably all day, every day. These are the kind of shoes that make an excellent wardrobe staple, suitable for wearing nearly anywhere. The orthotic insert is a valuable inclusion for men who work on their feet and need to stay comfortable while looking sharp. While it is always natural to sacrifice some style for comfort, the otherwise classic style and form of these shoes is offset by the large gusset in the facing and the shape of the toe, that makes these shoes unsuitable for truly formal occasions. The gusset helps the shoe fit better and provides more comfort, but is also a highly visible departure from formal, men’s dress styling. While they are a great choice for the workplace, they won’t pair with a tux. Stacy Adams knows everything there is to know about classic men’s formal shoes since they’ve been in the business for over 100 years. The Dickinson Oxford reflects this legacy of classic formal styling and attention to craftsmanship. The stylish antiqued leather, detailed brogueing, and structured toecap on the Stacy Adams Dickinson Oxford reflect classic styling and traditional construction, for a men’s dress shoe that can be worn on any occasion. The cognac color is striking and fashion-forward without being brash, or choose the classic black for the optimum versatility. The leather upper is finely detailed, while the interior is breathable and fully cushioned with memory foam for added comfort. These shoes look great and have timeless style. The leather upper has a great finish, and the colors have nice depth. They are true to size and comfortable on the feet. The sole is thin and lacks traction, transmitting impact and making these shoes unsuitable for regular daily wear. They are best worn on special occasions. These Mio Marino Oxfords come in a wide range of colors and style options for every occasion and every taste. Some models have detailed brogueing, some have sleek styling, some have more robust soles for heavier daily wear. With such variety to choose from, it’s easy to find the right men’s dress shoes that will suit your style and your needs. The Marino Oxfords are made of high-quality, genuine leather uppers with detailed stitching and construction. The rubber soles are durable and non-slip, making them suitable for daily wear. They come in a reusable waterproof shoe bag ideal when packing for travel and are backed by a 100% satisfaction guarantee with 45 days for free exchanges and returns, and a 180-day warranty. This commitment to quality and customer service helps ease any misgivings about what shoes to order online. These shoes not only look great in formal or business settings, but they come in half-sizes for a better and more accurate fit. They do run slightly large, so order a half-size smaller than your usual shoe size. They are comfortable to wear and the soles offer great cushioning from any impact. The toe caps collapse easily and are not well reinforced, which can prematurely end the life of these shoes, even with gentle wear. While it may seem at first glance that the range of styles and options for men’s dress shoes is rather limited, the truth is that there are hundreds of small details that make up a man’s formal attire. 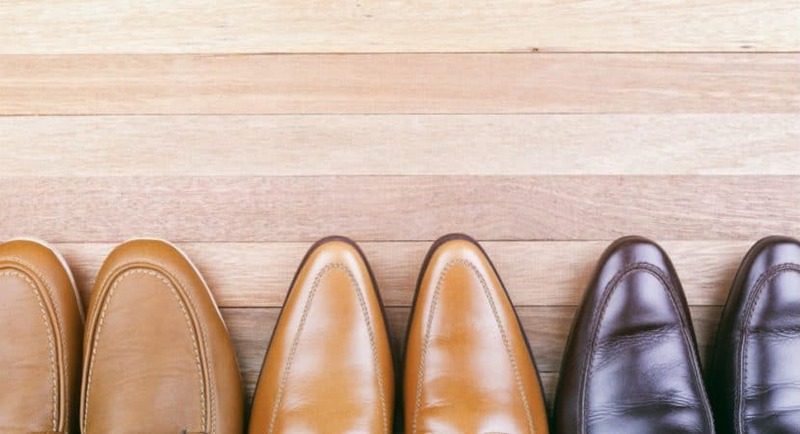 While a casual office or social gathering may not require much knowledge or preparation, there are a few things you need to know when choosing men’s shoes for a more formal occasion. Here are the important features to help guide your decision. While colors, textures, stitching, and brogueing (the small perforated patterns often seen accentuating the toecap and the vamp of a man’s shoe) add interest and detail in a man’s shoe, they are generally preferred for office wear and most social occasions. As a rule of thumb, solid colors are more formal than multicolored, and dark tones are more formal than light ones. For truly formal dress, a solid black is best, and, for black tie affairs, opt for black patent leather. 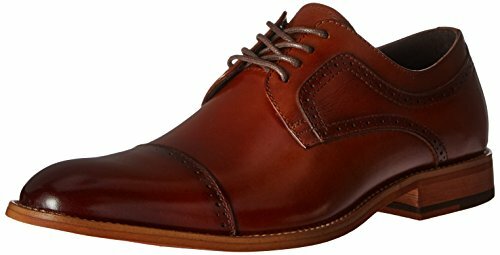 Many men’s dress shoes sold as “Oxfords” are, in fact, Derby style shoes. For your reference, if the laces are holding together the facing that is laying on top of the shoe, it is a Derby shoe. If the laces are simply tightening a facing that is sewn into the vamp (also called “closed” lacing) and integrated into the upper of the shoe, it is a true Oxford style shoe. Oxfords can be either “wholecut” or “cap-toe.” In the wholecut style, the upper of the shoe is a single piece of leather from the topline to the outsole, with no additional stitching. A cap-toe style has stitching along the vamp and (of course) the toe cap. The most formal shoes a man can wear, suitable for the strictest black tie occasions, but also suitable for any formal occasion where the dress code may be in doubt, are wholecut black patent leather oxfords. Cap-toe black patent leather oxfords are just slightly less formal, and will probably be acceptable as well. For formal settings that call for a suit, but not a tuxedo, Oxfords and Derbys are an excellent choice. Oxfords can have brogueing or be wing-tipped for a more decorative touch, but Derbys should be plain or cap-toe and worn with suits of lighter, more casual fabrics. For settings where fashion matters, and you are likely to wear a good jacket but no tie, single or double monk strap shoes are a good choice, particularly if you have an interest in fashion and want to dress to impress. Double monk straps are a bolder choice, as they call attention to themselves and make a bigger statement. Casual occasions are really when the Derby comes into its own. Here is where it is appropriate to wear Derbys with wingtips and/or brogueing to show off a smart, casual style. Men’s dress shoes come with three toe shapes: round, pointed, and squared off. Generally speaking, round toes are the safest choice for formal wear, as they are both the most traditional and the most versatile, and will do well in nearly any occasion. However, squared-off toe shapes can be more visually appealing and might be a good choice for a man who wants his shoes to make a fashion statement. If you need dress shoes that can go anywhere and do anything, choose a round toe. If you already have formal, round toe shoes as a staple in your wardrobe, and want to dress to impress from time to time, squared off toes are a fun option. The classic proportion of a man’s formal dress shoe has a heel height of 1- 1.5 inches, and no higher. While some fashion designers are making shoes for men with higher heels, they should be avoided outside of a party setting. If you want to appear taller in formal shoes, there are men’s formal shoes with greater elevation inside the shoe, where it doesn’t affect the visible style or proportion of the shoe. The fit of a man’s dress shoe is not only important for comfort but important for the overall durability of the shoe as well. A poorly fitting shoe will crease, bind, or wear unevenly, and quickly lose shape and handsomeness. The perfect fit in a dress shoe will cradle your heel securely, but leave up to an inch (but not more than an inch) in the toe box above your longest toe, to give room for movement as you walk. Across the top of the shoe, the vamp should fit snugly without too much adjusting of the laces. In an oxford shoe, the closed lacing should have a very slight V-shape, opening slightly toward the top of the shoe. A wide open V-shape, held together by the laces, indicates that the shoe is too small. That open shape will also reveal the wrinkles in the tongue that will develop if the shoe is too small or laced incorrectly. The V-shape of the lacings in an oxford should actually narrow slightly over time as you break the shoes in, rather than widening. In a derby shoe, the eyelets for the lacing should be parallel with no V-shape at all. 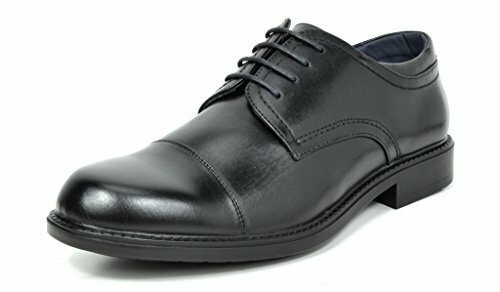 What is the best way to tie dress shoes? There is a right way and a wrong way to tie your shoelaces, and chances are, you’ve been doing it the wrong way. Properly tied shoelaces will sit horizontally across the foot, rather than turning toward an angle, and stay in place and not come undone, without resorting to the ugly double knot. To tie your shoes properly, form the initial knot as you normally would. Then form a loop with the lace in your right hand. Wrap the left lace around that loop, but wrap it counterclockwise, starting the loop close to your body and wrapping away from yourself. Then pull a loop of the left lace through the gap. The tiny difference of looping the left lace around counterclockwise, instead of clockwise, creates a knot that lays nicely across the foot and stays tied all day. Provided your shoes are tied correctly, you don’t need to learn a special knot for a formal occasion, but you may want to look up Parisian shoelace knots or Berluti shoelace knots for a little extra style. 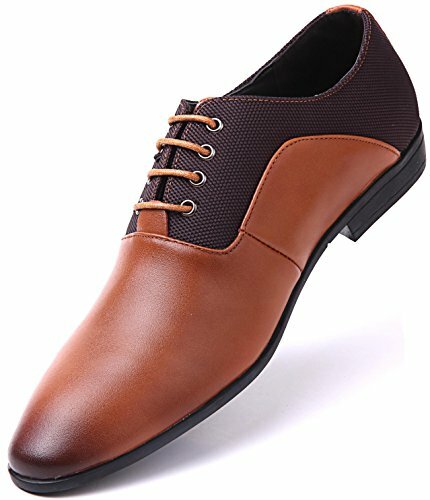 What is the best way to lace dress shoes? Start at the bottom row of eyelets closest to your toe, and insert the laces through the bottom row of eyelets from the outside of the shoe toward the inside. Align the laces so that they are even on both sides, and the middle of the laces is aligned with the middle of the shoe. Advance the left lace one eyelet on the left, toward the top of the shoe, and thread it back upward from beneath. Cross it directly over the top of the shoe toward the right side and thread it down through the second eyelet on the right side. On the right side, skip the second eyelet and thread the right lace upward through the third eyelet on the right side, then cross it horizontally over the top to thread it down through the third eyelet on the left side. Repeat, moving the lace from beneath up one eyelet and across the top, and then doing the same on the other side. Tie normally. For less formal shoes, like Derbys, you can use a traditional crisscross lacing. And laces should always be made of thin round or thin flat waxed cotton. What goes with royal blue shoes? It isn’t only Elvis who wears blue shoes. We’ve also seen them on celebs like Zac Efron, Jamie Dornan, and Victor Cruz. The truth is, you can wear royal blue shoes with anything, depending on the occasion and how fashion forward you are. To stand out from the crowd in a fashionable setting, wear royal blue shoes with a black or grey suit and complete the look with a matching tie. For a more relaxed look, use lighter-weight fabrics in neutral colors and wear a blue shirt that is a paler shade of blue than the shoes. A lighter blue will tie in with the shoes and enhance your fashion statement, without overwhelming. The trick with wearing eye-catching shoes is to allow them to take the focus, deliberately putting the shoes front and center. The rest of your ensemble should fit well and be slim, but rely on neutral colors that don’t compete with the shoes. If you want to wear the same color on the top half, wear that color in a neutral, desaturated hue to keep the focus on the shoes. Or wear a small accent piece, like a tie or pocket square, to augment and emphasize the shoes. If you wear bright colors all over, it looks gaudy and not classy. And if you choose a bright shoe and then style a whole outfit in shades of that color, it actually calls attention to the outfit, not the shoe. Brown ankle boots always look sharp with slim chinos or khakis. They can be worn with jeans, but that pairing often requires you to know how to correctly cuff your jeans, so they lay correctly against the boots. Too much fabric at the ankle easily throws off the look, so cuff your jeans in a way that works well with the boots. Brown ankle boots are best matched with a complementary sweater or jacket; it’s best if these are in a lighter or darker shade of brown than the boots, rather than being the exact same color. Black dress shoes can be worn virtually anywhere and with anything. They are the staple of a man’s wardrobe. Provided the shoes fit well, are laced correctly, and are clean and unscuffed, there is almost nowhere these shoes can’t go. However, it’s still important that black dress shoes be styled appropriately, and that depends on what style of shoe they are. Black oxfords are the most formal of shoes, and best worn with a suit. If worn without a shirt and jacket, and ideally a tie, they may look incongruous. They should not be worn with jeans. Black Derbys or brogues, on the other hand, are a little more relaxed, and can go with a wider range of wardrobe options. They will go very well with khakis or chinos. They can even be worn with jeans, provided that the jeans are clean, intact (distressed or holed jeans will not work with dress shoes), and slim fitting. If wearing black dress shoes with jeans, it’s also a good idea to wear a more formal jacket to balance the look. A man always needs a pair of classic dress shoes in his wardrobe, for periodic formal occasions where it is necessary. He will, from time to time, need to dress for a job interview, a wedding, or a fancy party, and he will need a pair of round toe, black, patent leather oxfords. They should have round waxed cotton laces, and be laced bar style, and tied correctly. Above all, they need to fit him well, so that he can wear them comfortably and they look good on him. A man who is expected to wear suits to the office every day needs at least one pair each of black and brown oxfords, with round toes, and round or flat waxed cotton laces. If his job involves a lot of walking and time on his feet, he should choose a traditional upper, but a thicker, more cushioned sole than in the most formal of dress shoes. It also helps to look carefully at the footwear of your peers and superiors and take cues from their fashion choices. After these essential investments are made, a man should choose dress shoes for other occasions in life, when he wants to look good and feel good, and the traditional expectations don’t matter so much. There has never been a wider range of looks, styles, and choices in men’s footwear. While the rules for the most formal events and gatherings haven’t changed, there are virtually no rules for what a man can wear at work and on the town. It’s a great time to explore new styles and make new statements with your shoes, finding out what works best for your unique self-expression.